Newborn babies are a symbol of immense potential, as they can grow up to be become virtually anybody, from an astronaut to the president. It is no secret that throughout life, there are critical junctions in which specific events or decisions can direct us on one path or another. Such events occur in our brains; during embryonic development neurons are born and establish connections with each other creating a network, which serves the initial needs of the system but is often vastly different from the final, adult network. This preliminary network undergoes remodeling during the first years of life, and again during puberty, to refine the network connectivity to better suit our changing needs. You can imagine that much like a computer, it is enough to have one pair of wires crossed to wreak havoc on the entire system, and indeed defects in pruning have been suggested to be causal for neuropsychiatric conditions, such as Alzheimer’s, schizophrenia, and autism. The refinement process is defined as the phenomenon in which exuberant connections that were formed during early developmental stages are selectively eliminated at later stages and often further refined by regrowth toward adult specific targets. This process occurs in a very stereotypical and timely manner in each individual. There are several mechanisms by which the nervous system can ‘tweak’ its connectivity, and these regressive events occur on different scales, from single synapses up to the elimination of entire dendritic or axonal processes while the cell body remains intact. We study these processes in the fruit fly Drosophila melanogaster. One well studied example of remodeling neurons, in the fly, is that of the mushroom body (MB) ɣ neurons. During the larval stages, the MB ɣ neurons extend primary processes to form a small dendritic tree, termed the calyx, and then extend bifurcated axons to form two distinct, medial and dorsal, lobes. During metamorphosis, the dendrites are pruned completely and the axons are pruned up to the branch point; subsequently MB ɣ neurons regrow their axons and dendrites to form adult-specific connections which are distinct from those of the larva. The MB structure is comprised of both intrinsic neurons (ɑ/β, ɑ’/β’ and ɣ also collectively known as Kenyon cells – KCs) and extrinsic neurons (MB output neurons (MBONs), modulating neurons, etc. ), and has a well described role in associative olfactory learning and memory both before and after metamorphosis. While there has been considerable progress in understanding how the intrinsic MB ɣ neuron remodel in terms of the molecules involved and the cellular processes employed, not much is known regarding other extrinsic neurons of the MB circuit, or if the circuit undergoes remodeling as a whole. Flies have two morphologically distinct life stages, larval and adult, separated by metamorphosis. This puts us in a unique position to identify neuronal circuits which establish functional yet distinct connections both before and after metamorphosis. Do these neurons coordinate their remodeling to establish functional connectivity in both stages of Drosophila life, and if so, how? In the lab of Liqun Luo in Stanford, a postdoctoral fellow, Xiaomeng Milton Yu, and a PhD candidate, Dominic S. Berns, were looking for a model to study neuronal remodeling at the circuit level. They came across a unique neuron, the Anterior Paired Lateral (APL), which innervates the adult MB structure in a very intricate manner. They used sophisticated genetic tools to show that it too underwent remodeling, in a similar timeframe as the MB ɣ neurons. Unfortunately, at that time, there were no adequate tools to study these neurons, so the project was left to “sit on the shelf”. When Milton left the lab, he and Liqun shared their findings with Prof. Oren Schuldiner, also a Lou member alumnus, for the possibility of continuing the study. When I joined the Schuldiner lab for my PhD, around the end of 2014, I was presented with this project as an optional project for my graduate studies. I immediately fell in love with it, and began contemplating on mechanisms through which different types of neurons could coordinate their development. My initial hunch was that these neurons, which classically communicate through neuronal activity and neurotransmitters, could somehow use the same communication mechanism to coordinate neuronal remodeling. The first thing I started doing, as a novice fly person, was to scan for tools, essentially going over many Gal4 driver lines in search of one that would allow genetic access to the APL neurons throughout development. Many of the so-called APL specific drivers exhibited no, or inconsistent, expression during larva. Luckily for me, however, a very nice paper had just been published (Lin et al., 2014)from the lab of Gero Miesenböck in Oxford, about the APL neuron. In this work the first author Andrew Lin generated a new driver line which labelled the APL in the adult in a very clean and striking manner. Andrew was nice enough to send over the flies, and soon after receiving them I characterized their developmental expression pattern and was delighted to notice that they labelled the APL neurons throughout all stages of development (Figure 1). Once I had found a good driver line highlighting the APL neuron throughout development, I started vigorously characterizing its development morphologically and molecularly. I quickly corroborated the initial findings that the APL undergoes remodeling in a similar timeframe as MB ɣ neurons. I then decided to test whether Ecdysone, the molting hormone in insects which was known to be a master regulator of neuronal remodeling, was also required for APL remodeling. As expected, when I inhibited Ecdysone signaling in the APL neurons and examined them during metamorphosis I saw unpruned APL neurites, indicating the requirement of Ecdysone signaling for APL pruning. When we examined these APL neurons at the adult stage, we were a little struck by what we saw, as the APL neurites which usually innervated the adult MB ɣ lobe were totally absent, while all other processes of the APL had regrown normally. This result puzzled us for a long time, and only after our initial submission of the paper for publication did we buckle down and analyze this phenotype. We hypothesized that the pruning and regrowth of the APL responded independently to Ecdysone signaling and set out to answer this question by inhibiting Ecdysone signaling in the APL only after pruning has occurred. This short side trip proved to be extremely interesting, as we found that not only are APL pruning and regrowth independently controlled by Ecdysone signaling, but that this differential control is probably regulated by different Ecdysone receptor isoforms. After we had established that the APL and MB ɣ neurons, that form both pre and post synapses between them and thus form a mini-circuit, undergo remodeling, we set out to examine our original hypothesis: whether or not the remodeling of these neurons is coordinated and if so, how. For this we planned on conducting two types of experiments; one would be where the APL neuron is missing or its pruning inhibited, and the other would be where the MB ɣ neurons are missing or their pruning inhibited. As we already had tools to manipulate the APL neuron while visualizing the MB ɣ neurons, we started with this set of experiments. Unfortunately, killing the APL neuron or inhibiting its pruning had very little to no effect on MB ɣ neurons. At that point we did not have a good way to manipulate MB ɣ neurons while visualizing APL development. Lucky for us, at this stage of the study, the lab of Chris Potter was working hard on developing new tools based on their QF-QUAS system. The QF-QUAS system is a parallel binary expression system, very similar to that of the conventional Gal4-UAS, and permits independent genetic manipulation of two distinct populations. This tool set was exactly what we needed and Chris’s lab was generous enough to generate a QF2 based MB ɣ driver for us. Armed with these new tools we set out to undertake the second arm of our plan, to inhibit the pruning of MB ɣ neurons and examine the development of the APL neurons. Upon conducting these experiments, we found that in animals in which we inhibited the pruning of MB ɣ neurons, the APL remodeling was significantly inhibited despite the fact that they were genetically untouched. These results indicated that our initial hypothesis was correct and that a coordination mechanism does exist! (Figure 2 top panel). At this stage, we thought we had a nice descriptive paper and we set out to send the project for publication. While our reviewers agreed that it was interesting, they refused to accept our work and pushed us to examine how this coordination occurred. Nonetheless, we were not deterred and fueled by our exciting findings we set out to test the second part of our hypothesis: is neuronal activity used to coordinate between remodeling neurons? (A-B) Confocal Z projections of 24h APF WT brains (A) or those additionally expressing EcRDN in the MB g neurons (B). EcRDN expression was driven by 71G10-QF2G4H (Lin & Potter 2016). APL neurons were labeled by the APLi-Gal4 driving the expression of mCD8::GFP (gray in A1’-B1’, A2-B2, and green in A1”-B1”). MB g neurons were labeled by 71-QF2 driving mtdTomato-3XHA (magenta). Dashed boxes represent areas that are shown in high magnification in A2-B2 and which were segmented into primary (blue) and secondary (yellow) branches. (C-D) Confocal slices of adult WT brains (D) or those expressing EcRDN in MB g neurons driven by 71G10-Gal4 (D), additionally stained for Bruchpilot – Brp (gray in C-D and blue in C’’’–D’’’), Dopaminergic neurons marked by TH (gray in C-D’ and magenta in C’’’-D’’’). Colocalisation between TH and brp staining (gray in C’’-D’’ and yellow in C’’’-D’’’). Dotted outlines indicate ectopic or presumptive larval unpruned MB g neurites. From Figure 3 and 5 in Mayseless et al, 2018. In order to test whether neuronal activity is involved we inhibited MB ɣ pruning but at the same time also inhibited MB ɣ neuronal activity. 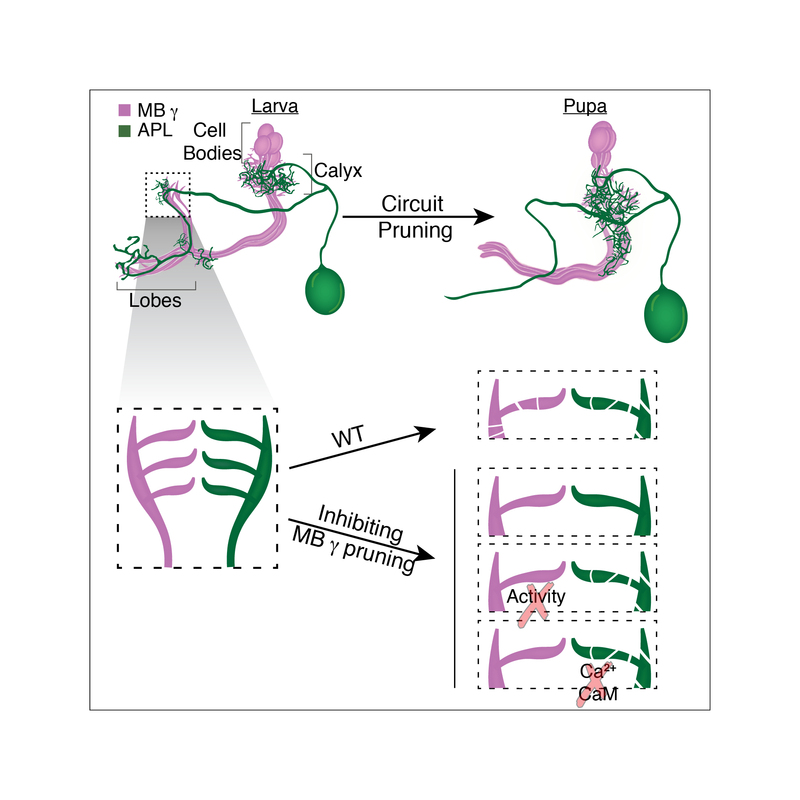 Remarkably, this uncoupled the development of the APL from MB ɣ and “allowed” the APL to undergo proper pruning even in the presence of unpruned ɣ neurons. We then wanted to ask what was the responding molecular mechanism in the APL, and tested whether Ca2+-Calmodulin nuclear signaling, a mechanism previously shown to play a prominent role in neuronal activity mediated ‘neuroprotection’, was involved. It was! Inhibiting nuclear Ca2+-Calmodulin signaling in the APL while inhibiting MB ɣ pruning had also uncoupled their development. Together, these results corroborated our initial hypothesis almost entirely. Not only are remodeling neurons capable of coordinating their remodeling but neuronal activity and Ca2+-Calmodulin signaling play a major role in this coordination. Finally, we wanted to understand what is the meaning of this coordination for the adult animal. Does the inhibition of MB ɣ pruning influence the morphology of the APL at the adult stage? Is this the only neuronal population affected? Do they establish functional synaptic connections? We therefore examined the APL neurons as well as dopaminergic and serotonergic neuronal populations at the adult, all of which appeared to not only change their morphology in response to the inhibition of MB ɣ pruning, but also to form potentially functional synaptic connections with these unpruned larval MB ɣ neurites (Figure 2 bottom panel). In summary, our data suggests that miswiring of one neuronal type may have profound implications on the general connectivity of the adult nervous system. Extending these findings into humans, suggests that even a relatively minor defect in remodeling of specific neuronal populations may change the circuit in a substantial manner and result in a system-wide defect which could underlie potential pathological conditions, such as Alzheimer, schizophrenia or maybe even autism. Lin, A.C., Bygrave, A.M., de Calignon, A., Lee, T., and Miesenböck, G. (2014). Sparse, decorrelated odor coding in the mushroom body enhances learned odor discrimination. Nat. Neurosci. 17, 559–568. Mayseless, O., Berns, D.S., Yu, X.M., Riemensperger, T., Fiala, A., and Schuldiner, O. (2018). Developmental Coordination during Olfactory Circuit Remodeling in Drosophila. Neuron 1–12.